A common myth is that decayed baby teeth leads to decayed adult teeth. This is not true. However, any poor habits established during childhood will be carried into adulthood, so for your children’s health, try to develop good habits. Below is a bunch of information we hope you find useful. Baby teeth are important for speech development, eating and most importantly, because they help keep the space open for the adult teeth. The ultimate aim of children’s dentistry is to maintain the necessary baby teeth only until they are due to be lost at the correct stage of development. 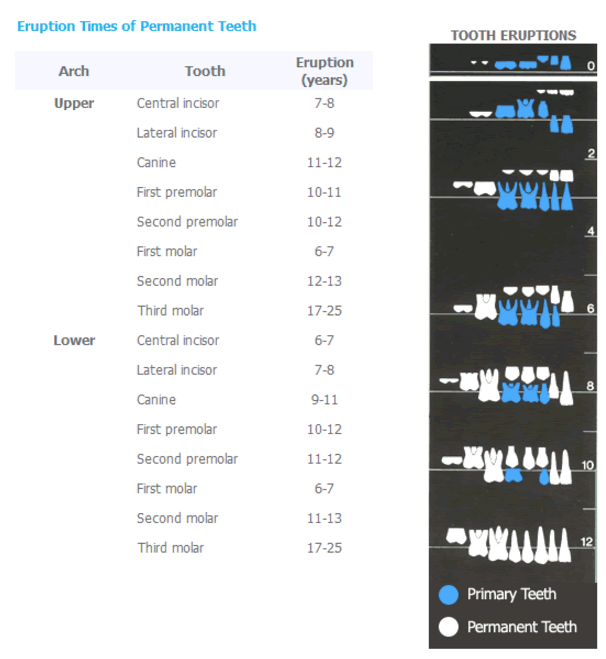 When do baby teeth (primary teeth) appear? Teeth start to erupt between 7-12 months of age and all 20 baby teeth should be there by the age of 3. This can be a challenging time for parents and the baby can show various signs of teething, which include excessive salivation, red cheeks, irritability and fever. Our teething advice is to treat the temperature and pain with your usual painkiller eg children’s Panadol or Nurofen. You could also try the topical anaesthetic types of gel like Bonjela. Always follow the directions on the pack for correct use. Cold face washers to chew on can be effective on sore gums as well as cold chew toys. However, you may find that comforting and distracting your child is effective too. When do I start to brush their teeth? Start by brushing without toothpaste and as a fun thing to do as young as possible. The first teeth to come through are at the front. As soon as baby teeth appear, progress to using a tiny amount of children’s strength toothpaste after breakfast and especially just before bed. Why shouldn’t I put my baby to sleep with a bottle? Babies and toddlers can choke on the contents of the bottle if left in bed with them. Also, when feeding babies to sleep, milk and juice can pool in the mouth particularly around the back teeth, allowing dental decay to occur. Bacteria (plaque) are always present in a mouth. If the bacteria are given sugars (soft drinks, juices, milk, lollies) and starchy foods (chips, biscuits, crackers) too often throughout the day, the bacteria convert the sugars or starches into acid and the acid starts to dissolve away your tooth. This is called an ‘acid attack’. 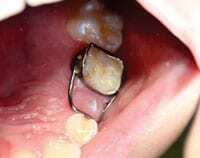 Gradually it becomes decay and it works deeper into the tooth until the tooth collapses or pain is felt. Teeth can usually only cope with 5 acid attacks a day. Decay often first appears in places where the bacteria can easily build up e.g. in the grooves of teeth, or between teeth. There are three main parts to prevention of tooth decay in children. They are hygiene, diet and dentist. Hygiene – Teeth must be brushed at least TWICE daily, preferably by an adult for children under 7 years old. The most important time is just before bed, when many children (and parents) are tired and more likely to miss this step. The parent should brush their child’s teeth, then let them try themselves for practice. Use a gently-flavoured children’s toothpaste and a small amount of paste. Children should brush their teeth 2 times a day; after breakfast and especially just before bed. Diet – Minimise sugary foods. Don’t allow your child to snack on sugary or starchy foods between meals and avoid grazing. The more frequently children eat or drink, the more often the teeth are exposed to an acid attack. They should only drink tap water in between breakfast, lunch and dinner. The last drink of the night after their last brushing must be water (not even a bottle of milk). Think of the 5/2 rule of ‘Protecting Tiny Teeth’. Children should eat 5 times a day; breakfast, morning tea, lunch, afternoon tea and dinner. From 6 month babies are only learning to drink from a cup. Breastfeeding or bottle feeding will still be the main way they obtain the milk. Drinking from a cup is a gradual learning process however by 12 months an infant should generally be drinking all fluids from a cup. Sugary fluids should not be placed in infant feeding bottles and comfort sucking on a bottle should be discouraged. Never put sugary fluids eg honey on dummies. Dentist – We are here to identify any developing damage, to suggest methods of prevention, and to initiate preventative techniques such as fissure sealants and fluoride treatments. We are here to help, not to criticise. 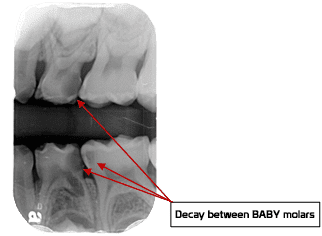 If we start seeing children at an early age, we can pick up early decay with X-rays, and treat with simple fillings. If the decay is not treated, it often progresses quickly and the child might first notice a hole when they start getting food stuck in there. They usually complain of pain after dinner at night time. At this point it is too late to try a simple filling as the small baby tooth won’t be able to hold it in place, and the filling will fail. The solution is to enclose the baby tooth in a crown. For an adult tooth, this would be a custom-made crown which is quite expensive but will last for many years. But for a baby tooth, we want something simpler that only has to last several years until the baby tooth falls out naturally; here we use pre-made stainless steel crowns. 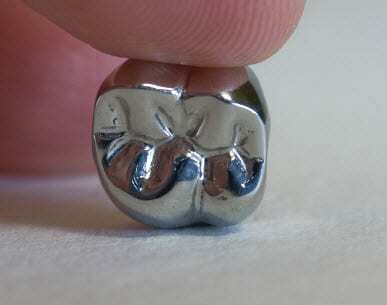 The baby tooth is trimmed back, and the correctly-sized crown is cemented over the top. Most children can tolerate this minor procedure in the dental chair with local anaesthesia. Sometimes they might need help with sedative techniques. After the crown is fitted, it will feel strange for about two days until it settles in. It is especially important to keep it clean during this time. In cases where the hole in the tooth is very large and the decay reaches to the nerve, we must also remove some of the nerve. In an adult this would be a complicated treatment called Root Canal Therapy which requires removal of the entire nerve, and is designed to last many years. But for children we do a simpler procedure called a pulpotomy where only the top part of the nerve is removed, and some medication is placed, then sealed. The tooth is finally covered with a stainless steel crown. Again, the aim is to preserve the baby tooth long enough for it to fall out naturally. Pulpotomies have a success rate of about 85%. Sometimes the baby tooth has to be extracted. To prevent the adjacent teeth from tilting into the gap and preventing the adult tooth from erupting, it is necessary to keep the gap open with a “space maintainer”. This is usually made up by a prosthetic lab, and comprises a metal band which fits around the molar at the back, with a metal loop extending over the gap and touches the tooth in front. The front baby teeth fall out usually between 6-8 years old, then baby teeth are progressively lost, up until the age of about 13. The adult back teeth are the most important teeth to keep and maintain healthy. Our Tooth Fairy comes in to visit our practice several times in the year. Children are welcome to drop in, take photos, play and talk to her in our waiting room. It’s a lot of fun and encourages children to look after their teeth! Little boys usually like to wear a costume (Spider Man, Hulk, cowboy etc) and so do the girls. 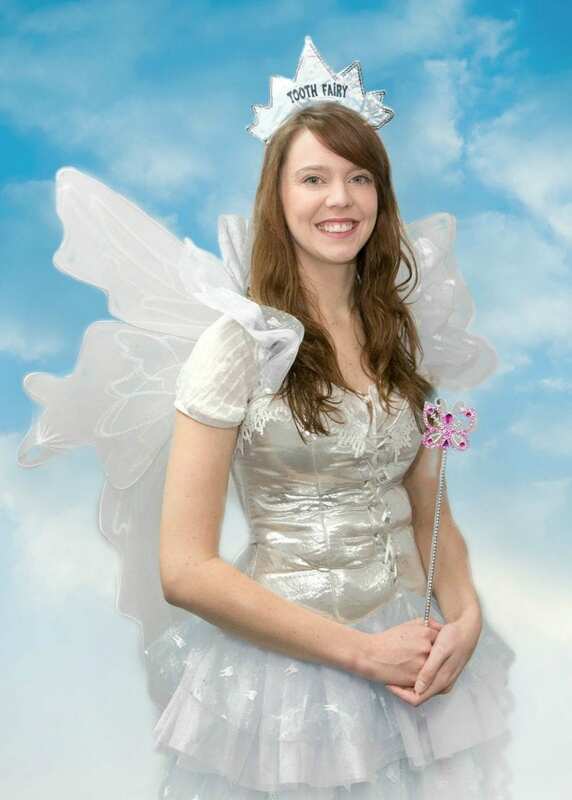 We have a cute selection of fairy costumes that will fit babies through to 10 year olds. Even the parents and grandparents will put on wings and hold the fairy wands for the photos! It’s a wonderful time and the Tooth Fairy usually has little gifts to give out. If you have a child that believes in magic, we even send out letters to the children if they wish, just let us know!